The Petoskey area of Northern Michigan has parks, waterfront, and riverfront areas that are just waiting to be explored! Petoskey's Sunset Park just off U.S. 31 near downtown Petoskey is just as its name implies: a fabulous place to watch the sun set into Little Traverse Bay. Just below the bluff is the Bayfront Sunset Park. Here you can watch the sunset at a different angle closer to the water. Stroll along the waterfront or near the waterfall. Bayfront Park extends from Petoskey's marina along the waterfront. There is ample parking and places to picnic or play frisbee. The Little Traverse Wheelway runs through this magnificent waterfront park. Visit the Little Traverse History Museum, also located along the waterfront. Bear River Valley Recreation Area is just across Lake Street from the Bayfront Park. Stretching along the Bear River as it opens into Little Traverse Bay, this is the place where fishermen (and women!) gather to bring home dinner, kayak, bike, walk, hike, and more. A $2.4 million project completed in 2011 makes the Bear River Valley Recreation Area truly spectacular. Magnus Park, located on Lake Street beneath Northern Michigan Regional Hospital (located on the bluff above) has camping, picnicking and a rocky shoreline to hunt for Petoskey Stones. The Little Traverse Wheelway runs through Magnus Park. 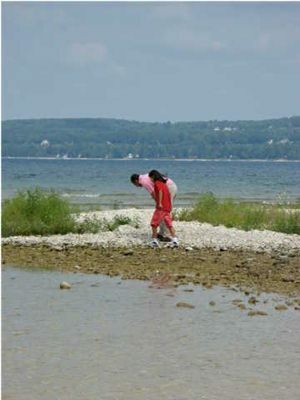 And, course, the Petoskey State Park is one of Michigan's premier state parks complete with camping, hiking, a fabulous beach, and lots of Petoskey stones waiting to be found! The Petoskey State Park is year 'round destination.